We arrived in Williamsburg on Friday evening after an afternoon of driving in and out of rain. Beth had found us a suite, which meant we weren’t all crowded into the same hotel room, quite the luxury. There was a living room area between the kids and us, so we stood a chance of sleeping past six. We even had a king bed. There was a kitchen, too, but no time to cook. It took a long time to check in and we wanted somewhere quick to eat so we were happy to find a Noodles & Company nearby. This is one of the kids’ favorite chains and it’s somewhere they’d both get vegetables and protein. We’d opted to visit Busch Gardens on Saturday instead of Friday because of the weather and sure enough we could see the rain coursing down the windows as we ate, but we were lucky to get out of and back into the car during breaks in the storm. We went back to the hotel and everyone went to bed. The kids did let us sleep until around seven. There was a breakfast bar downstairs, so we ate and headed for the park. 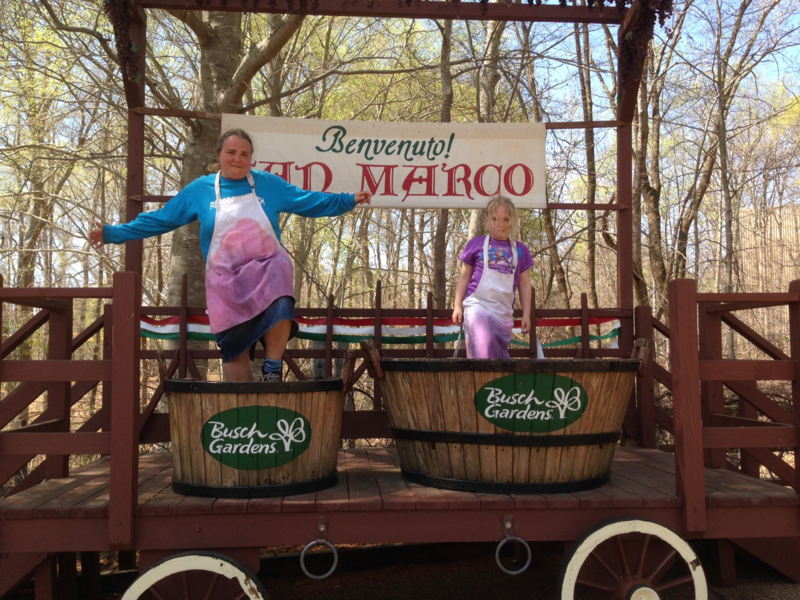 If you’re not from the East Coast, Busch Gardens may require a little explanation. It takes the theme in theme park seriously and the theme is Western Europe—specifically the British Isles, Italy, France, and Germany. (There’s also an area devoted to New France, or French Canada. Beth guesses they needed somewhere to put the frontier-themed rides all amusement parks seem to have.) The park is quite pretty. It’s no Cedar Point, of course, as it lacks Lake Erie, but it does have a lot of trees and flowers. Daffodils and tulips were everywhere. And the admirable adherence to the theme means there’s a lot of hokey scenery. Classical architecture and statues in Italy, big beer barrels marked Oktoberfest in Germany. You get the picture. We took a lot of cheesy photos, especially in Italy because my sister has spent of a lot of time there (in the real Italy) and I thought she might get a kick out of it. I liked the little touches—graffiti in Latin on the walls near the food court, fake ironwork on the bathroom stalls in Germany, etc. No one but June had a strong opinion about what to do first, so after we entered the park, in England, which was strung end to end in Union Jacks, we headed for Germany and the Curse of the DarKastle ride, pausing only to get a dolphin painted on her face. The artist used a stencil and spray paint, which I’d never seen before. I thought $10 was a bit steep for face paint but it really lasted. It was still there three days later when June finally asked me to scrub it off because it was a little smudgy. When we got to the castle it wasn’t open yet, so after admiring the icicles that hung from it and other details, the kids and I went and rode the swings twice and then it was open. The DarKastle, as you might guess, is Busch Gardens’ version of a haunted house. You wear 3D glasses and the effects are all computer-generated. Call me old-fashioned but I prefer a haunted house with actors or material props and scenery. June, however loved it and wanted to go right back on as soon as we got off, so I took her on again while Beth and Noah waited for us. Next, after a long line that wound through what looked like a stone passageway in an Irish castle, we rode Europe in the Air, a flight simulator, with views of various icons of Western Europe (Stonehenge, the Coliseum, etc). It’s similar to an IMAX film, except the seats tilt and shake as if you were flying. It made both Beth and me a little ill.
We had lunch in shifts, Beth and Noah and I had crepes in France before Europe in the Air, and then June and Noah had pasta in Italy after it (yes, he did have lunch twice) while Beth and I got gelato. The kids also rode a ride that looked like a gondola in Italy and that was about all we did, other than buy a t-shirt for Noah (who has outgrown most of his from last year) and ride the sky ride to get from one place to another. We would have liked to try one of the water rides (Escape from Pompeii looks fun) but it wasn’t quite warm enough to get soaked. We also considered riding the sightseeing train that circles the park, but there wasn’t time as we had a long drive back to Maryland and we needed to leave mid-afternoon. We enjoyed our trip to Busch Gardens but part of day seemed almost long enough. We all agreed it’s not as good an amusement park for us as Cedar Point or Hershey Park. What we all missed was any moderate coasters. 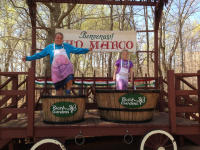 There were kiddie rides and big thrill rides, but nothing that fit our niche. I am not the daredevil I was (briefly) in my teens and early twenties, but I do still enjoy a classic roller coaster and there was nothing like that. I thought Noah, who’s a little braver than me, could probably handle Loch Ness Monster, but he took a look at it and said no. So, we bid adieu to Europe and drove back to Maryland. We almost always go out for Indian when we return home from vacation, so we did that. We weren’t quite finished being tourists, though, because the cherry blossoms were in bloom and we went to see them the next morning. We were lucky to catch the peak this year, as it only lasts several days, and we’d been gone over a week. It was the latest peak since 1993, according to the National Park Service, occurring about a week past the average date. 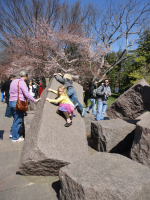 It was also a beautiful Sunday morning, in the low seventies and sunny, so we expected crowds, both for the blossoms and for a ten-mile race that was taking place along the Tidal Basin. Our friend Tom (June’s friend Talia’s dad) was running and we looked for him as we watched the race go by, but we didn’t see him. Getting across 15th Street to get from the Metro stop to the blossoms turned out to be quite the challenge, with the race going down it. We waited around ten minutes for a break in the race and were just about to sit down on the curb and eat our picnic breakfast right there when suddenly a bunch of other people who were also waiting to cross the street made a break for it and we all dashed through the middle of the race. We walked the whole perimeter of the Tidal Basin, something I almost but not quite take for granted now, after years of having kids too little for that hike. Anyway, it was lovely. And June had fun climbing the rocks at the FDR Memorial, as always. We’ve been home almost a week now and are well into the routine of work and school. 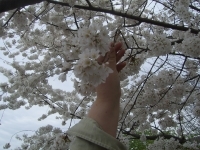 The cherry trees along the streets in Takoma Park are well past their peak. We keep seeing the white petals blowing through the air (the other day Noah came home from school with his curls full of them) and little green leaves are replacing the flowers. Our dogwood is budding, the daffodils are almost finished, and there are tulips in our back yard. The flowers and flowering trees of home are sweet reminders of the flowers of the road—at the altar at YaYa’s church on Easter morning and in the gardens of the Biltmore and along the highway in North Carolina and in the plantings of a theme park version of Europe. Have I mentioned we had ten snow days this year, six over the limit of built-in school days and the school district is only making up two? I have? Oh, yes, of course. What I haven’t mentioned is that despite the fact that there are five contingency days clearly scheduled on a calendar sent home at the beginning of every year, that when the school district decided to make up the measly two days, only one of those two make-up days was on one of the contingency days? The other one came out of spring break. 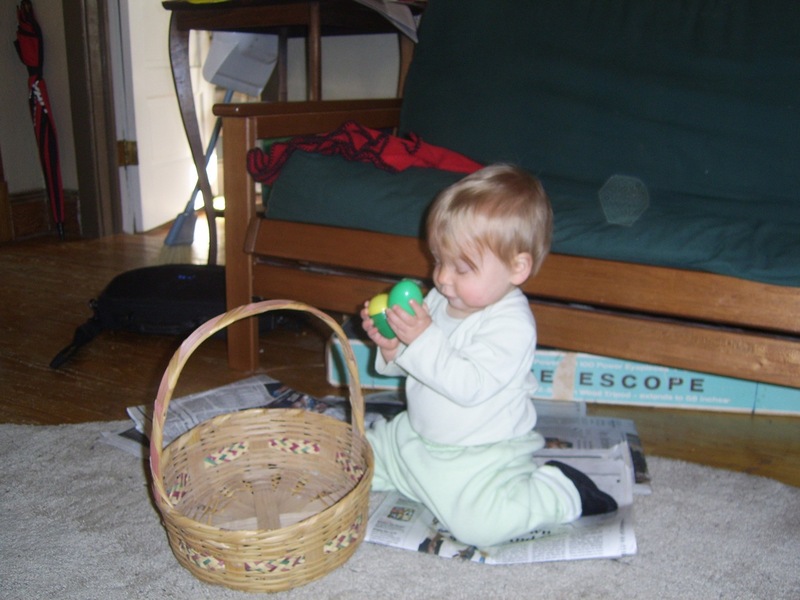 Now it could have been worse, we could have been faced with the horrifying prospect of school in session while we had a beach house rented, but it was just the tag end of spring break, Easter Monday, which fell two days after our return. 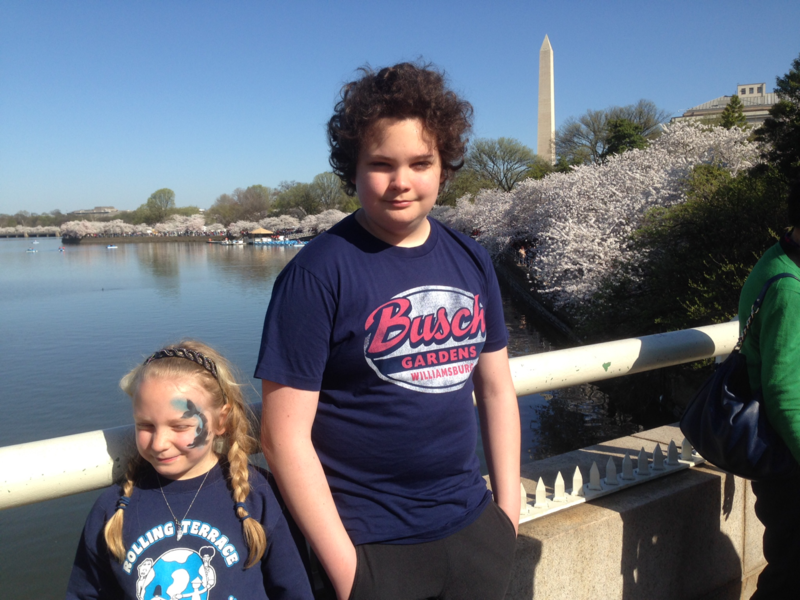 But the fact remained that Beth had made an orthodontist appointment and a dentist appointment for Noah on Monday and June had more exciting plans, in the form of two tickets for the White House Easter Egg Roll Beth received from a colleague. We decided to stick with our plans and kept Noah out of school. June went to school in the morning, but I picked her up around noon to take her into the city. So despite my letters to the superintendent of schools and to state officials about how the school year should be extended, I ended up in the seemingly hypocritical position of only sending one kid to school for a half day on the first make-up day. 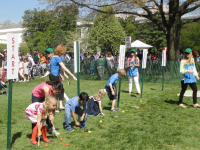 But perhaps you wanted to hear something about the Easter Egg Roll itself? Crowded would be one description. While we were standing in one of many lines I heard someone say there were thirty thousand people there. I checked later and it’s true, although they weren’t all at once—thirty thousand tickets were issued in five time slots. We were in the fourth slot, 2:30-4:30. After a picnic lunch outside the Takoma Metro stop where Beth dropped us off en route to Noah’s dentist appointment and a train ride into the city, we arrived at the Ellipse and got into line around 1:40. I did consult my map when we got off the Metro, but if I’d misplaced it I could have just as easily followed the hoards of dressed up children heading in the direction of the White House. It took an hour and ten minutes to go through security, get our wristbands, and wait in line to enter the South Lawn. As we inched along, I read How to Cheat A Dragon’s Curse to June until we got closer to the front of the line where music was playing and it was no longer possible to read without raising my voice. 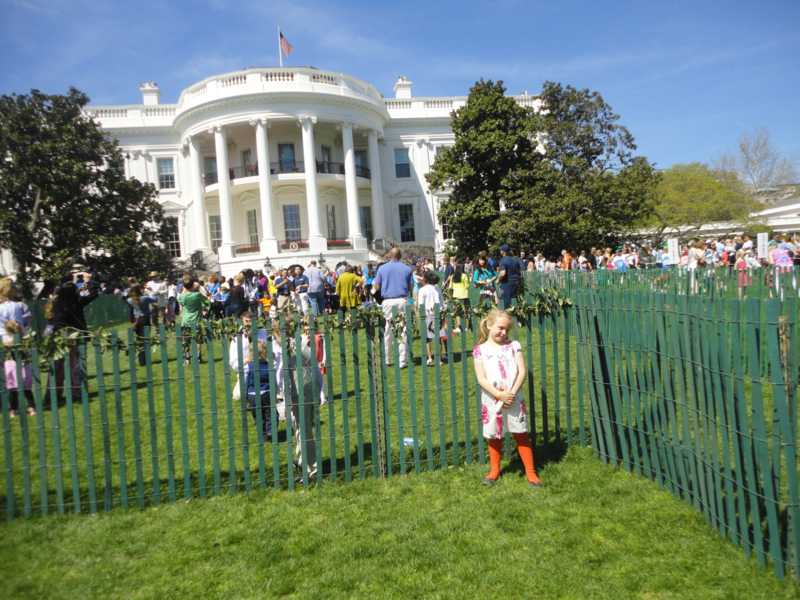 As we approached the White House June wanted to know exactly when we’d crossed into White House property. We were walking along the sidewalk, next to a wrought iron fence and I told her the squirrel on the other side was on the White House lawn. She seemed thrilled to be that close. Once we got inside we had to choose from all kinds of activities, but we headed straight for the Egg Roll itself because that’s the classic event and our time was limited. 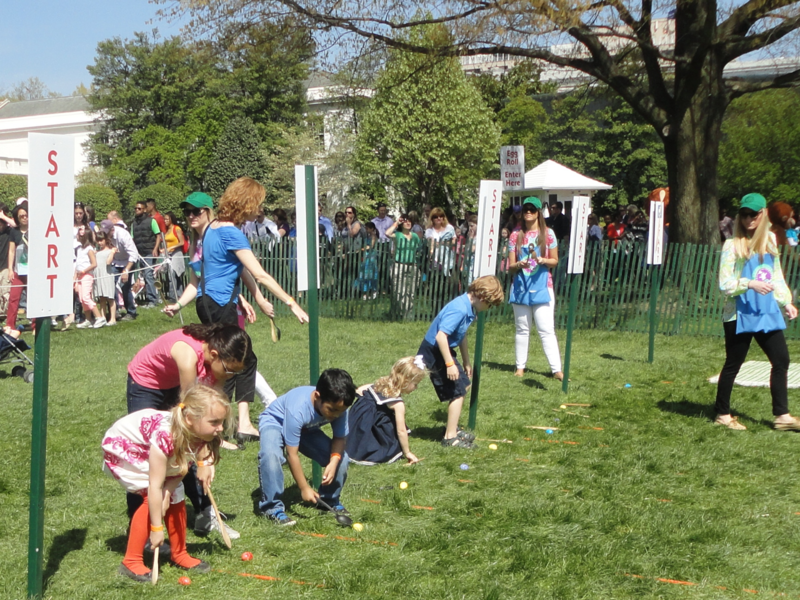 The line there was pretty short and soon June was pushing an egg across the grass with a long wooden spoon right in front of the South Portico of the White House. Next we headed for the snack area where we shared an apple, some baby carrots in a kefir dipping sauce, and bottled strawberry-kiwi smoothies. We peeked at the White House vegetable garden and noticed that their kale is doing better than ours. June had a hard time deciding between the story-telling stage where Miss America would be reading stories or the obstacle course. We stood in line for ten minutes outside the roped off storytelling area before realizing that at the rate it the line was moving (not at all) we’d be admitted after Miss America was finished and Debbie Reynolds had begun and as June had no idea who Debbie Reynolds was, we left the line and headed for the obstacle course. Next we headed to a booth where she did a science experiment, making hypotheses about which objects from a jumble on the table would sink and which would float in a tub of water and then testing her hypotheses and filling out a checklist of her results. By the time she finished, it was time to hit the restrooms and get in line again to exit. We were issued a box of Peeps and a commemorative wooden Easter egg as we left. It had been fun and exciting but also kind of exhausting between the sun and the crowds so when June asked if she could get a soft pretzel from a street vendor the idea of sitting down on the grass and eating seemed attractive so I bought it for her and an eggroll for myself before we got back on the Metro and headed home. 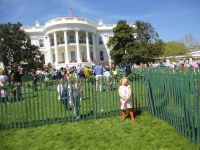 I’m glad we went, though, because although we’ve been to the White House several times—once for a Christmas tour pre-kids, once on a regular tour when June was in preschool (“All The Presidents’ Pictures,” October 19, 2010), and once for a garden tour a year later-—we’ve never been to the Easter Egg Roll and it’s an iconic Washington springtime event, just like the cherry blossoms. 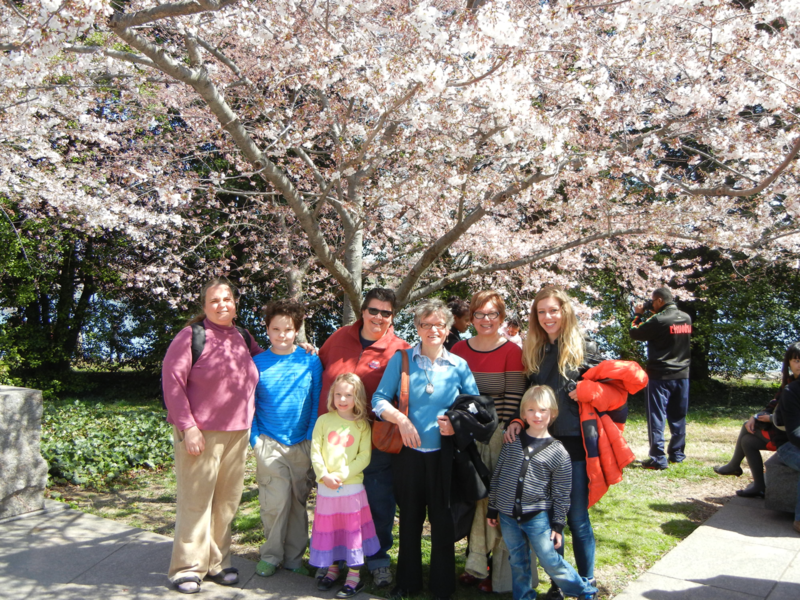 We did go to see the blossoms this year, the Friday before we left for the beach. 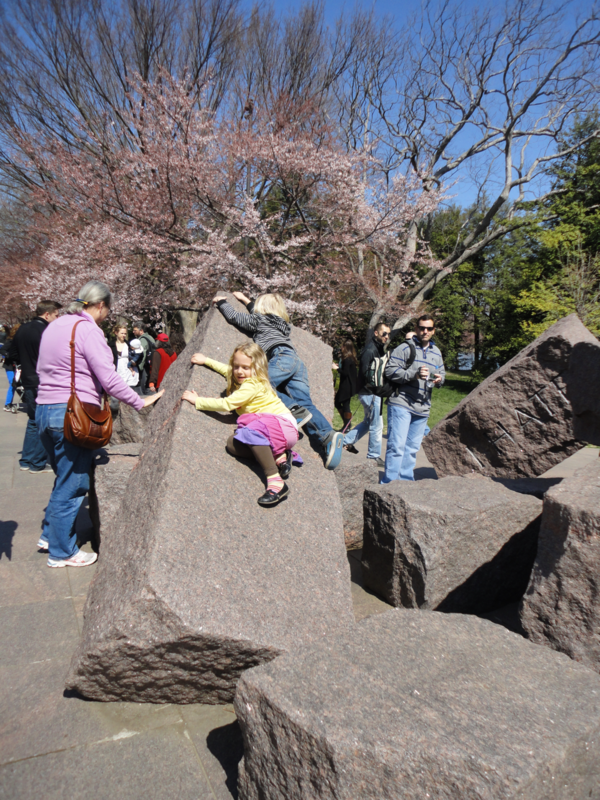 They are often a logistical challenge, mainly because of the short peak bloom period, which is difficult to predict more than a few days ahead of time, and parking issues. We ended up going in the evening after June’s violin recital and pizza dinner because Saturday was busy with June’s kung fu lesson and packing for the beach. It was a hurried trip and not ideal in some ways, but beautiful as always. And the kids did seem to enjoy the novelty of going at night. As we left Noah surprised me by saying, “This was fun. We should do this more often.” I pointed out we go every year. “No, in the dark, in the rain,” he said. I probably wouldn’t want to go the Easter Egg Roll every year, even if such a thing were possible and it isn’t; most people who go win their tickets in an online lottery, which is a better system than we first moved to the Washington area and I’d read in the newspaper about people camping out overnight in line for tickets. 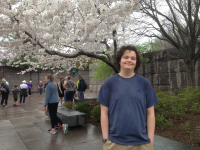 I might also need to give up the tradition of always going to the cherry blossoms, because it is hard to manage some years, especially for Beth, who has to drive and park if we don’t end up taking the Metro. Still, I do feel fortunate to live here, among the symbols of democracy and the fragile pink and white blossoms that herald the arrival of spring each year. On Thursday morning I put June on the school bus with the instructions, “Have a good last day of school as a five year old,” and she flashed me a brilliant smile. June is six now. She was born right before the cherries bloomed on the Tidal Basin. She was six weeks early, and developed a bad case of jaundice so she had to stay at the hospital three days after I was released. I hated being separated from her, even for those three days. We were constantly shuttling back and forth between the hospital and home, with bottles of pumped milk in tow. The hospital was just around the corner from the Tidal Basin so one day either on the way to the hospital or on the way home, we made a drive-by visit. Beth dropped me and Noah and YaYa off to walk around a bit while she circled in the car (parking is often impossible when the cherries are in bloom). We were just a little too early, but we found a couple of blooming trees for a quick photo-op and then we hopped back in the car. The trees bloomed in earnest soon after and I wanted to go back, but once we got June home, she had to be wrapped in a phototherapy blanket round the clock, allowed out only to nurse, and we just couldn’t make it. Even though we didn’t take her that first year, I still associate the cherry blossoms with the surprising, chaotic days after her birth. 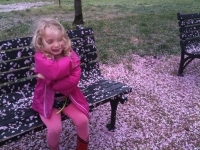 We call her our cherry blossom baby, just as Noah is our iris baby. At 6:35 a.m. on Friday the phone rang. I wondered if it was a wrong number or an early-rising relative wishing June a happy birthday. Instead it was Baskin-Robbins, seeking advice of the frosting color of the ice-cream cake we’d ordered for June’s party. The whole cake-buying experience was bizarre. June had fallen in love with this cake because it had real half-sized ice cream cones on top but Beth had customer service challenges placing and picking up the order and in the end we got a cake that said “Happy June Birthday” instead of “Happy Birthday, June.” So, just a word of warning if you’re local and you don’t like receiving business calls before dawn or scrambled messages in icing–consider another vendor. After Beth confirmed that pink frosting was fine, we all went to the living room where June’s wrapped presents were arrayed around her new two-wheeler. “A bike,” she said in a matter-of-fact tone. “I like the bike.” Then she tore into the other presents. We got her a cat-themed math game, Rat-a-Tat Cat, partly because her party theme was cats and partly because it looked fun. Noah got her a bell for her bike and a pair of headphones (she uses headphones to watch television or play on the computer while he’s doing homework and he thought she’d like her own pair). Everything else was clothes. My aunt Peggy sent Hello Kitty pants, we got her a Hello Kitty t-shirt, a numeral six t-shirt and other summer clothes and pajamas. There were clothes from YaYa, too, including a pair of ladybug rain boots. It was only after all the presents were opened that June really focused on the bike and decided she wanted to ride it right then. I told her she needed to eat breakfast and get dressed and ready for school first. In the end, she had about five minutes practice in the driveway before I put her, clad in her number six t-shirt and new leggings, on the school bus. “Have a good day, six year old,” I told her. Again, she grinned at me. When she got off the bus, she was holding a cardboard crown. Her teacher does not allow birthday treats to be sent in from home, but birthday celebrants get a crown and everyone sings “Feliz cumpleaños” to them. I’m used to more elaborate school celebrations, both at preschool and in elementary school, but June seemed satisfied. 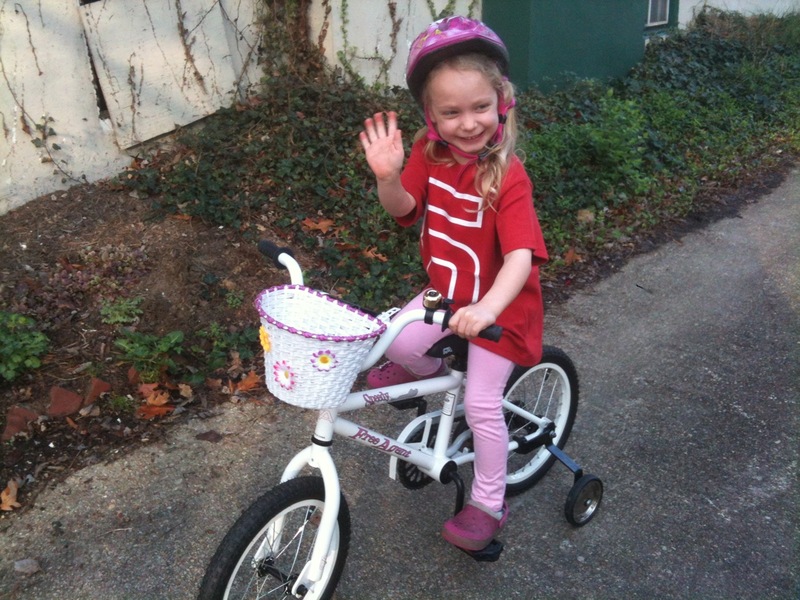 She wanted to practice riding her bike again–she’d do it three times before the day was out and she got a little better every time. (By Saturday morning she could pedal up a slight incline and her turns were impeccable.) She said she thought we could take the training wheels off. I counseled her to wait. My mom arrived for a weekend visit around 4:15, and there were more presents to open. A pair of summer pajamas with cats on them had arrived during the day (“The cat’s pajamas” I told Beth—how could I resist that joke? ), as had a rubber bracelet from Auntie Sara. It has holes in it and it has letters you can fit into the holes to spell words. It came bearing the words Junie Dell. (Dell is June’s middle name, and mine, too. I used to call her Junie Dell when she was a baby. It was one of those baby nicknames that didn’t stick except with Sara, but I like that Sara has a special nickname for her.) The next day, June changed the words to “I love you.” Mom brought all kinds of presents—a giant wooden Pinocchio marionette, a tiny vase with a purple ceramic cat attached to it, a paint-your-own tea set kit, and of course, clothes. June selected the belt from one outfit and decided to wear it with the other outfit (a hot pink t-shirt and leggings to go under a blue sundress with pink flowers) at her party the next day. I gave June an early bath because we were going out for pizza at Roscoe’s and I wasn’t sure what time we’d be home. It was a warm evening so we sat on the patio, eating wild mushroom crostini, marinated olives (I let June go over her olive quota for the day), salad and pizza. They were out of gelato because their freezer was broken, so we headed over to Capital City Cheesecake for cheesecake and cannoli. When we got home, it was June’s bedtime and her big day was over. But the next day was probably just as exciting because it was her birthday party. We spent the morning and early afternoon running birthday errands, cleaning the house, assembling gift bags and getting the porch ready for the pin-the-tail-on-the-cat game and the piñata. I’d originally envisioned these as front and back yard games, but rain was predicted, and sure enough it started drizzling around 11:30. Beth and June went out to pick up the “Happy June Birthday” cake and to buy yellow roses and six balloons in varying designs. One has a cat wearing a birthday hat and sunglasses. Another is the exact Dora balloon June got for her birthday last year. When you tap it, Dora sings “Happy Birthday” in English and Spanish. The sound of the song was still etched deeply into my brain, and Beth’s, too, so she set some strict ground rules about under what circumstances one might tap the balloon to hear the pint-sized bilingual songstress go at it. Next we moved out to the porch for pin-the-tail-on-the-cat. 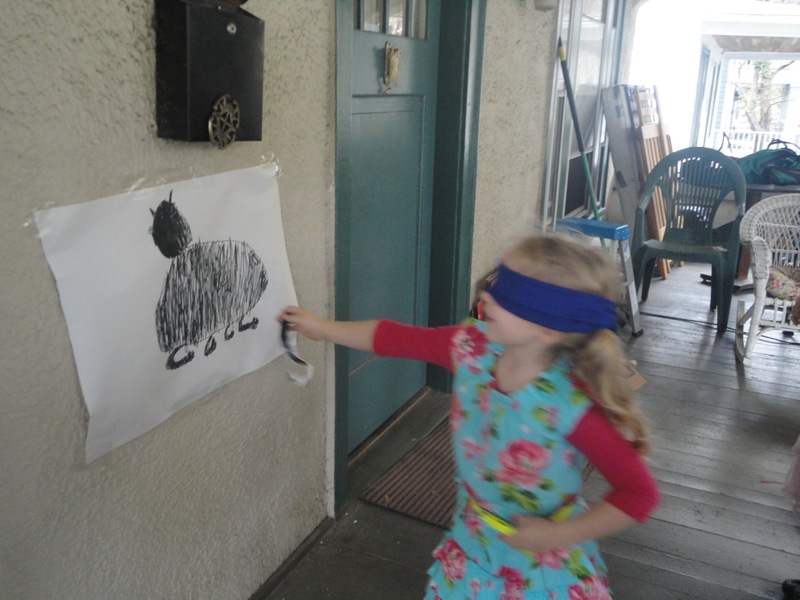 Last spring June attended a classmate’s birthday party that had classic games as the theme–pin-the-tail-on-the donkey, sack races, etc, and it occurred to me that though you don’t see kids play them much any more, these games are classics for a reason. It was a really fun party. 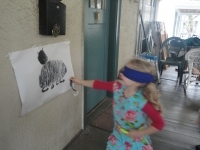 So I tucked that idea away in the back of my mind, and when June came up with the cat theme for her party I was all ready with pin-the-tail-on-the-cat. June was all over it, especially since she could make the cat and the tails herself. One by one, I blindfolded the guests and gently spun them around six times each and let them go, sometimes with a subtle correction if they left my hands going in the wrong direction. The kids laughed hysterically as the tails went onto the cat’s face or the air above its body. A couple of them got the tail on or pretty close to the cat’s rump—I think Talia’s was the best placed. Back inside, it was time for games. We had two and let the girls divide into groups and choose which one they wanted to play. The first one was The Cat in the Hat, I Can Do That. In this game, you lay cards together to form instructions for a task to perform with props from the story and you get points if you complete it. June got this game for Christmas and was more interested in playing her new game and most of her guests followed her lead, but I supervised a game between Talia and Megan and then started another round with Talia, when Megan had lost interest and Talia wanted to keep playing. Beth says she wished she’d thought to get a picture of me trying to wriggle my way under a low foam arch, while balancing the fishbowl in one hand. Mom and Noah had played Rat-a-Tat Cat with June earlier the in day so they could get the hang of the rules, and Emelia already knew them because she had the same game at home, so the card game went smoothly. Beth said they all seemed to get the hang of it pretty quickly and enjoyed it. When the games were over, we set everyone up with paper and crayons and asked them to draw cats, as a souvenir. Some of them drew the Cat in the Hat, others drew Hello Kitty and others went with non-branded felines. Keller divided her paper into three sections and did one of each. We had cake next. The kids thought “Happy June Birthday” was hilarious, an improvement on “Happy Birthday June” really, and as Beth divvied up the little cones they were agreeable about not all getting their first choices in ice cream (each cone was a different flavor). As we ate cake, Mom sat on the couch with Morgan’s mom and baby brother and got acquainted with her, finding out she went to Oberlin—Beth’s and my alma mater. She even lived in Noah Hall, the dorm where Beth and I met, and after which we named Noah. I gathered up the goody bags so the guests could stash their piñata booty in them and we headed back out to the porch to smash it. All the kids had at least two turns. When a hole opened but no candy fell out, Megan tried to tilt the piñata (or maybe enlarge the hole) by poking her stick in the hole. It was Noah who finally sent the candy cascading to the floor with some mighty whacks. Morgan’s mom commented that older brothers have their uses. June wanted to know if we could have some music while we waited for parents to come collect the guests. When Beth put on Blue Moo, June asked Talia quite formally, “Talia, will you dance with me?” and Talia did. They danced joyfully around the living room as June’s birthday party wound down to a close. It was cute to watch, especially since I am so very fond of Talia, whom I’ve known since she was not quite two. After the guests left, June opened her presents–a book, three stuffed animals (including a cat of course), a mermaid magnet set, and a Lego café kit. June wanted to assemble the café right away, but we went out for Indian first, and then she set to work on it. It was hard to tear her away to go to bed. She finished it the next afternoon, following all thirty-three diagrams–less than twenty-four hours after receiving it, and impressing Mom with her small motor skills and her tenacity. 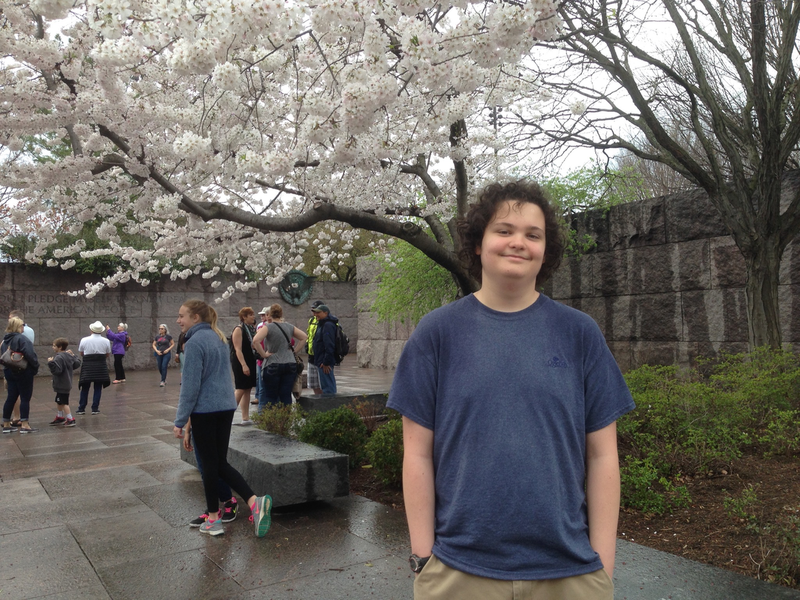 The final adventure of June’s birthday weekend was an expedition to the cherry blossoms and the new MLK memorial. 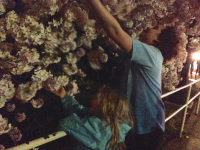 The peak bloom period is short and notoriously difficult to predict. Mom has never caught it, though she often visits us around June’s birthday. For awhile the predicted four-day peak period spanned the weekend and we thought luck was with us, but then a few eighty-plus-degree days accelerated the blooming and the peak period moved back, ending Friday. I thought if we went Friday it would be too hard to get back by bedtime, and going on Saturday before the party would make for a stressfully jam-packed day, so we waited until Sunday. Now I will say that given the choice between a few days before the peak period and a few days after I would choose after every time. There are drifts of petals on the ground and blizzards of them in the air with every breeze; there are petals in muddy puddles and on the rippling water of the Tidal Basin, and there are damp petals stuck to every horizontal and vertical surface. In its way, it’s almost as magic as the classic picture postcard puffy pink and white blooms. It looks like confetti strewn on the street after a particularly wild party. So in a way it was a fitting end to June’s birthday celebration, an after party of sorts. She got to christen her new boots in the puddles, eat hot edamame from a stand, admire the trees (solemnly telling us “all trees are beautiful”), run through the paths between the tulip beds at the Floral Library, take pictures with Beth’s phone, joke with her brother, give her grandmother countless hugs, hold hands with everyone and seize the joy and the beauty of the moment and of being six. On Wednesday morning I was toweling June off after a bath and she noticed my shirt in the bathroom mirror. “You have letters on your shirt,” she observed. The shirt said, “Feel the Power: VOTE.” I got it back in the early 90s when I worked for Project Vote (http://projectvote.org/?gclid=COWA_PW90JkCFR4hnAodPEgwvQ). “VOTE” is the largest word on it. “Do you see a V?” I asked June. She pointed to the V. “How about an E?” She pointed to the E. We went through all the letters in “VOTE” and she got them all right. In the past several weeks June has become intensely interested in letters. She doesn’t know all of them yet (maybe 75%), but she’s learning more all the time and she can recognize her own name. She is always asking us what letters begin various words and what sounds they make. The wooden alphabet puzzle she inherited from Noah has become a favorite toy. She’s taking the first wobbly steps of literacy and it’s exciting to watch. So I read a lot of alphabet books to her these days. Luckily we have quite a few, though ABC: A Family Alphabet Book (http://www.proudparenting.com/node/309) is a favorite. Reading these books over and over (and reaching the twenty-six month anniversary of this blog) has inspired me to make an alphabet of our lives over the past twenty-six months. Most of the pictures have appeared in the blog already, but a few are new. A lot has changed since I started writing here, both for our family and for our country. June has turned one, two and three. She’s learned to walk and talk and started school. Noah has turned six and seven and he seems bound and determined to turn eight next month, despite my protests that he can’t possibly be that old. He overcame a difficult kindergarten year, learned to read and stopped believing in Santa Claus. He’s now thriving in second grade. Since I started writing a woman came tantalizingly close to winning the Democratic nomination for President and an African-American won the Presidency (and the world economy imploded, but let’s not dwell on that). Here’s June playing with her alphabet puzzle on Saturday morning. She and I were at a coffee house and she was cruising around and around a low table, eating bits of Fig Newton I handed her every time she passed by. She paused every now and then to remove the sugar packets from their container and scatter them across the table and floor and then she replaced them. As she reached the corner of the table closest to me, she let go and stood, swiveled on her feet to face me and smiled, as if she was going to do something dramatic. I waited, holding my breath, thinking this was the moment. Then she chickened out, dropped to her knees and crawled to me. I don’t know when she will walk any more than when Noah will start having an easier time in school. It could be months from now or right around the corner. 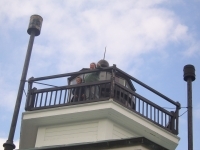 (April 25, 2007). June took her first steps about a week later. 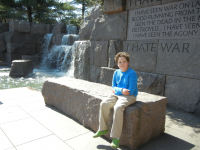 Noah’s school troubles cleared up when he started first grade with more sympathetic teachers. We went to see the cherry blossoms on Friday and it was…challenging. June had been very cranky for almost a week. She’d been sick the weekend before and at first we thought that was the reason but by Friday she’d been better for several days so I’m not sure what was up with her. Anyway, she wailed in the car, she whimpered in the stroller and when she was walking she kept tugging on my arm, wanting me to go in another direction. At one point she darted under a chain and headed straight for the Tidal Basin before Beth dashed off to capture her. Anyway, the blossoms were gorgeous and afterwards we went out for really excellent pizza in the city that made me wish we still lived there. June threw fits in the restaurant, too. Gabriel is usually known as the Caterpillar on this blog. He’s a sweet, affectionate, well-loved boy, who will be three in July. His moms are hoping to adopt a younger sibling for him. They are looking for an African-American or biracial baby. Here is their webiste: www.emmyandbethadopt.com. Please visit if you think you can help. This was the first headshot of Noah that appeared on the blog. It was taken in December 2006 at the Children’s Museum in Wheeling, West Virginia. This is from my very first blog entry. June’s hair turned blonde the following summer. Just around the time I reached the tricky part of the operation, spooning the batter onto the griddle and making sure none of the pancakes burned while I was distracted by something else, they both wanted my attention at once. 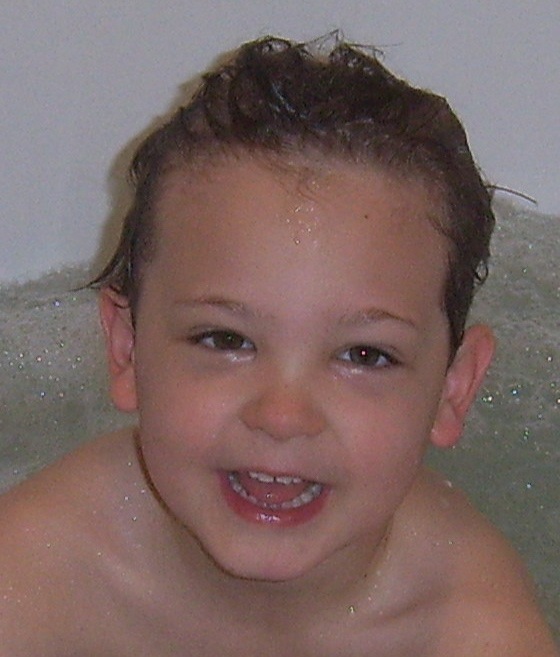 This was the headshot of Noah when he was in first grade. If you remember the photo and thought he was wearing a bandana on his head, those are underpants. Beth took it on their mother-son camping trip in September 2007. You were expecting something else? I took this picture on Thursday. 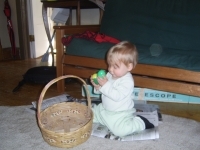 I can’t claim this blog consistently captures the national zeitgeist, but if you have or once had elementary-school or preschool-age kids, or if you live in Takoma Park or its environs, or if you’re gay, lesbian or bisexual, I hope you sometimes find a little of yourself reflected in it. Thanks for reading. Like many of you, no doubt, I first encountered this poem in high school. I’ve always liked it, but guess I wasn’t as far-sighted as the twenty-year-old speaker because fifty springs seemed pretty long to me then. Now that I have used up more than forty of my allotment and my parents are in their mid-sixties, it doesn’t seem long at all. My mother recently told me that as she approaches her sixty-fifth birthday, death seems a lot closer, a lot more real. She’s already a few years older than her mother was when she died. Of course, the poem is as much about life as about death, about enjoying life and savoring its fleeting beauty. There’s a word in Japanese for this, “hanami,” which refers to the act of viewing cherry blossoms and appreciating the “ephermeral nature of life,” (unless the staff writers at The Washington Post are putting us on.). For me, the cherry trees will always be a reminder of June’s birth, because they were just starting to bloom when she surprised us by entering the world six weeks early two springs ago. 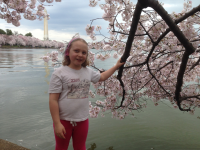 Beth and I first started going to see the cherry trees in bloom along the Tidal Basin in 1991, the very first spring we lived in the Washington area. I still remember the magic of that first visit, the delicate beauty of the blossoms, their extravagant profusion, and the holiday atmosphere as people picnicked and strolled around the water. We’ve been back every year since, except one. Having a premature baby in the hospital undergoing phototherapy re-arranges your schedule and your priorities. Even that year, though, we did try, but we missed the hard-to-predict peak and couldn’t get back in time to see it. 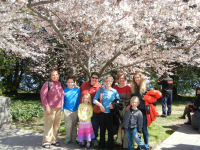 We have been to the blossoms as a couple, as parents and with extended family on the rare occasion that relatives were lucky enough to time their visits in sync with the fickle blooms. We made our yearly pilgrimage this morning. The idea was to arrive early, before the crowds and we did make it out of the house by our 8:30 target, despite a meltdown on June’s part and foot-dragging from Noah who had no idea why we would want to go, since blossoms are “not special.” Nevertheless, when we arrived at 9:15, the crowds were already there. Cars were circling around; parking was scarce. This year for the first time, the Park Service is running a free shuttle to remote parking, but it didn’t start running until 10:00, so we parked in remote lot at Hains Point and walked to the Tidal Basin. 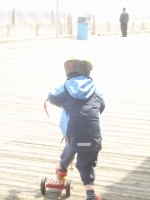 It was cold, probably around 40 degrees, and there was a stiff wind blowing off the Washington channel. March is apparently not going out like a lamb this year. I sipped my take-out caramel macchiato to keep warm. “I’m cold! I want to go home!” Noah complained. I wondered if it was really worth the hassle to drag the kids down here every year. 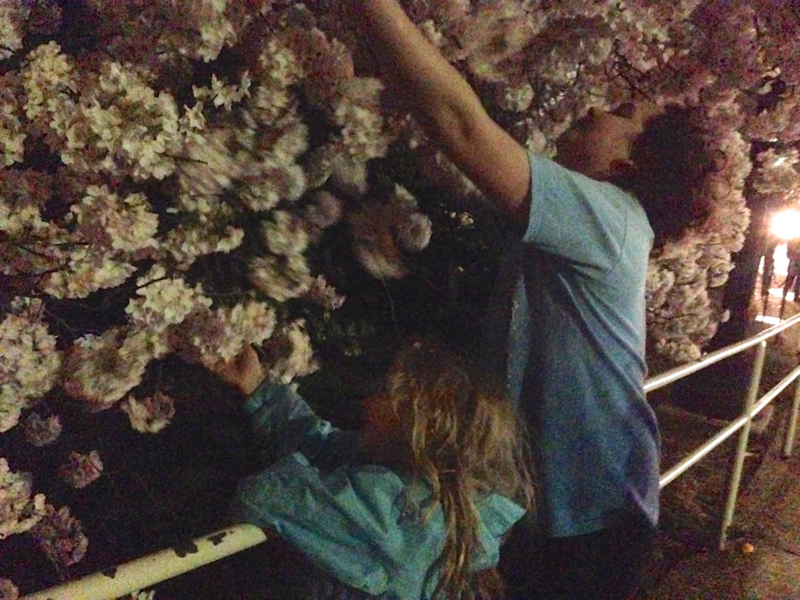 It was a lot easier when we lived in the city and we could walk to the blossoms from our apartment. Parking wasn’t an issue and no one whined or complained during the outing. Some years we would go more than once. I remember going alone one year after Beth and I had already gone and camping out under a tree to read or maybe grade papers. I stayed for hours, working, listening to the radio on my Walkman, and taking in the beauty of an early spring day. Then in less time than I thought it would take, we were there. We hit the peak perfectly this year. Almost every tree was in full bloom, their branches laden with puffs of white and the palest pink. They look like popcorn trees or cotton-candy trees or something out of Dr. Seuss, a more fragile cousin of the Truffula tree perhaps (http://en.wikipedia.org/wiki/The_Lorax). We ate a breakfast picnic on the steps of the Jefferson Memorial. After the bran muffin, lemon pound cake, coffee cake and orange juice were devoured, Beth bought Noah a cherry blossom festival magnet in the gift shop and soon he was running around happily, shaking hands with trees, hiding behind them and snapping pictures of them. He ended up taking more photographs than anyone else, including two of those featured here. We didn’t stay long because it was cold and June got cranky. “Aww…Do we have to go?” Noah asked. I would have liked to walk the whole perimeter of the Tidal Basin, as we used to do, and will again someday, but it wasn’t in the cards for us this year. To look at things in bloom, less than an hour was little room, but it had to be enough. Beth’s uncle Gerry died early Monday morning, at home, surrounded by family. He was a well-traveled man, with a hungry mind, a crusty exterior and a dry wit. He had a Ph.D in math. He could fly planes and speak Polish. While bed-ridden with the cancer that killed him, he was teaching himself ancient Greek. Gerry is survived by his wife Carole (Andrea’s oldest sister), his sister Patricia, his children Meghan and Sean, his daughter-in-law Aine, and six grandchildren: Micheal, Tristan, Holly, Kawika, Rebecca, and Eanna. Gerry was sixty-nine years old, so he didn’t quite have his three score and ten, but even if he had, it would still seem like too little room, much too little.